I can count to potato & Windows 7 was my idea! Remember those Windows 7 commercials? 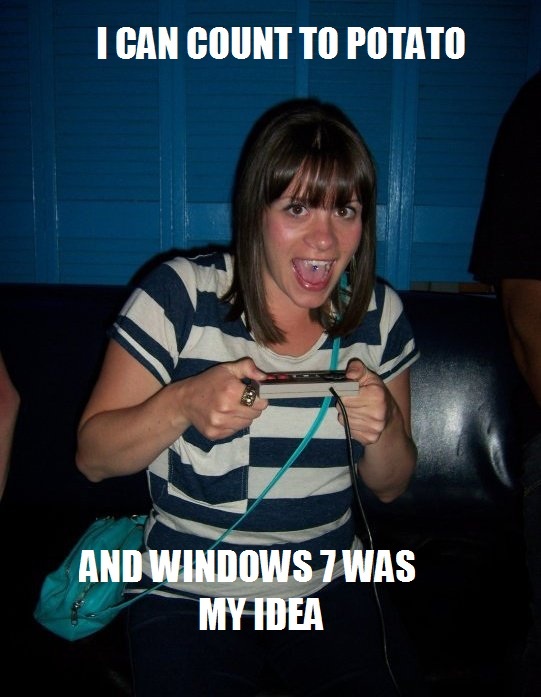 Where every Joe Blow was suddenly claiming that Windows 7 was THEIR idea? Well my name is Jamie and Windows 7 was MY idea…when an automatic Vista update corrupted files to load the operating system and I was left unplugged until I figured out a way to back up the content of my hard drive and attempt to repair Vista. A week and a half later, I managed to repair Vista and upgrade to Windows 7 to avoid the buggy problems all the techies talk about with Vista. Please don’t ask why two grown, working adults only have one laptop to work from – that’s another blog called “Why I’ll never buy a Toshiba laptop in my life” followed by a blog titled “What to do when your laptop emits smoke everyday for 2 years”. I read an article today by Download Squad about Microsofts new slogan: “Be what’s next”. I don’t know if this is a new slogan, or what Microsoft developers keep dreaming, but I know I don’t really like it. I’ll admit it, I like Microsoft. I use my brother’s hand-me-down iPod and that’s about it. As I’ve just mentioned, my current computer is running a Microsoft operating system (even after another Microsoft operating system effectively self-imploded) and my computer prior to this was a Toshiba. It’s not that I dislike Apple or think Microsoft is better, it’s just what I’m used to and what I can afford right now. I just really, really dislike this new slogan. More on this tittilating subject later…I’m on hour 19 of my day and need to catch a few zzzz’s in order to finish this thought!